Turn off your computer when you leave. By switching your PC off when you go home, you'll stop approx 500kg of CO2 being emitted per annum. Try turning off your computer when you go to lunch or whenever you are away from your desk for 15 minutes or more to save even more power. Ensure all equipment and appliances use power save modes. All computers, printers, fax machines, and copiers currently in use are Energy Star certified for energy efficiency, with 'power-down' modes and other energy-saving features. Turn lights and equipment off when you're finished using them. 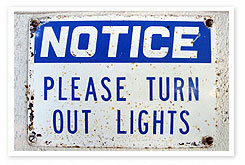 Switch off unnecessary lights and equipment as you would at home, even if they are on a sensor system. One fluorescent tube releases one kilogram of greenhouse gas every 15 hours! Use natural light where possible. Arrange your office and working spaces to take best advantage of natural light and keep the lights off while you work (lighting can account for up to 20 per cent of the energy used in our offices). Dress appropriately for the season. By wearing a jumper in winter you can turn your heating thermostat down a couple of degrees (say to 20° Celsius) and save a lot of energy. Use cold water where possible. When rinsing out your coffee cup, use cold water instead and save the energy used to heat water unnecessarily. Shut off the power at night. Many hardware stores now sell powerboards which have a remote control on-off switch, so you can now turn off the stand-by-power of systems without having to climb under the TV or sound system to do so. Have an energy audit done to identify further energy savings. An investment in an energy audit helps save the planet - and will almost definitely save you money over the long term. Go carbon neutral. Set a stretch goal of becoming carbon neutral. Consult an energy audit, reduction and offset experts and make it real for your organisation.